In March the "Prunedale Park Planning Committee" (PPPC) was formed by some interested Prunedale community members and members from the Neighborhood Watch Facebook group. The PPPC has partnered with NCYRA to create an all ability accessible playground that will be located in the Manzanita Sport Complex. This is a special project for the people and children of our community. 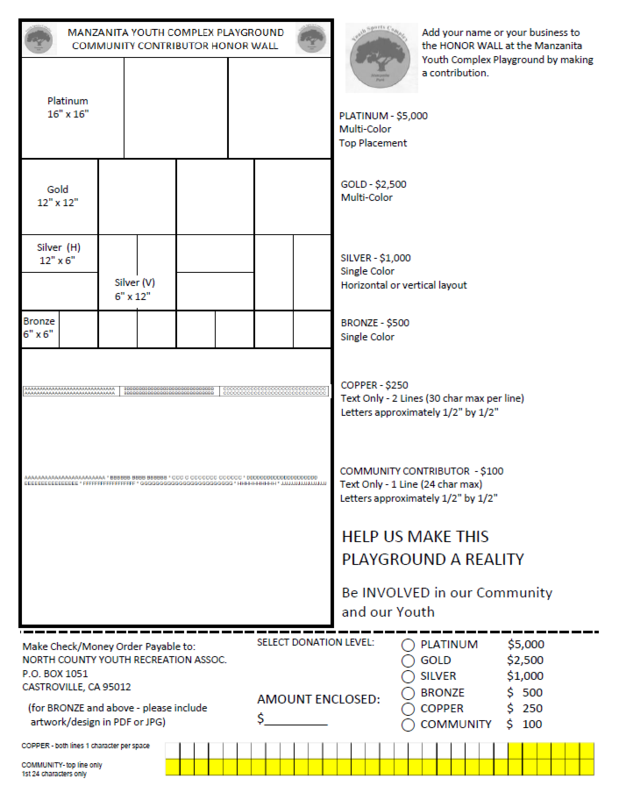 It is our mission to create and develop a playground for children of ages 5-14. This playground will also be designed so to be played in, loved by and enjoyed by children with special needs. This as all projects at the complex will have to be developed with the hard work of community volunteers. ​ Our goal is to raise $80.000 for materials and to be completed by December of 2018. Community support and donations are crucial for this endeavor to be a success. We thank you in advance for any monetary donation that you can support this project with. We have different levels of support that will be displayed on our "Honor Wall", the wall will be erected next to the playground for all to see. 12"x 6" or 6"x 12"